Apple (AAPL) has risen by about 6.8% so far in 2018 -- impressive for less than three months, but underperforming the Nasdaq Composite index's roughly 8.8% YTD gain. However, AAPL shares have gained 31.3% over the past year, beating the Nasdaq's 27.8% increase over the same period. That's quite a 12-month gain, but it naturally leads investors to wonder whether there's any additional upside to be had with Apple shares. Given our $200 price target, which is above both the stock's $179.97 close Tuesday and analysts' $192 consensus price target, we believe the answer is "yes." While it's true that Apple is primarily a smart-phone company, it boasts an installed base of more than 1.3 billion across its various devices (with a loyalty rate near 95%). In our view, that reflects not only the ease of use that Apple has become known for, but also a growing list of services that make its ecosystem incredibly sticky. What this likely means for Apple is that even as smart-phone sales growth slows, Apple will continue to benefit from replacement demand, especially if newer iPhones have more memory and features that lead to higher average selling prices. From augmented reality and virtual reality to health-care applications and 5G, there are ample upgrades to be had in the coming years that will require greater iPhone processing power and memory. We're already hearing chatter about the next iPhone and iPad iterations to be had in 2018. We expect these rumors to only intensify ahead of Apple's next Worldwide Developers Conference, which historically occurs in the second calendar quarter and focuses on what's next in iOS, MacOS and tvOS. At the same time, we foresee Apple strategically expanding its reach into new products. For instance, the company recently introduced the HomePod smart speaker, while the upcoming AirPower wireless-charging pad gets AAPL into the wireless-charging business. 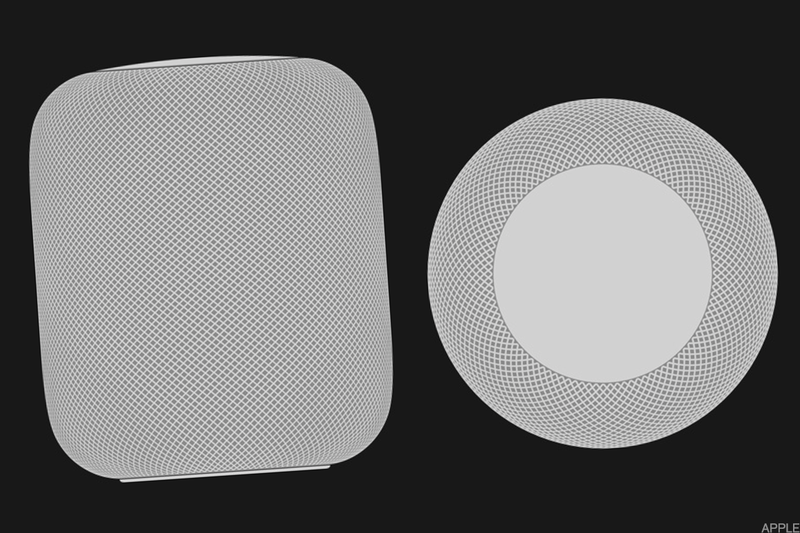 The Apple HomePod smart speaker. We also hope to hear more concrete plans about Apple's push into original content -- a move we think will make the tech giant's ecosystem even stickier (and likely result in even more people switching to Apple devices). Consumers historically flock to the content that they want, which plays right into Apple's wheelhouse given the firm's leading position in smart phones and tablets. And let's not forget the key strategic platforms that Apple has -- iTunes and the App Store. Additionally, while Apple has historically been a consumer company, it's also seeing adoption of its products in the enterprise market. For example, Banca Intesa Sanpaolo, one of Europe's leading banks, has chosen iOS as the mobile standard for its entire 70,000 Italian employee base. Likewise, leading U.S. optician LensCrafters plans to use more than 7,000 iPad Pros to provide digital eye exams and digital optical measurements in a personalized and interactive experience. With enterprise partners that include IBM (IBM) and Cisco (CSCO) , we expect Apple to see even further market-share gains in the enterprise market, especially as so-called "BYOD" ("bring your own device") expands around the globe. Apple's recent fiscal-first-quarter earnings report delivered better-than-expected top- and bottom-line results, confirming that the iPhone and other Apple businesses continue to grow revenue as the company benefits from higher price points. And as for the current quarter, analysts expect all Apple businesses to show double-digit percentage growth year over year. Beyond the iPhone, Apple's Services, Wearables, Mac and iPad segments are leaders in their own right, breaking new ground as additional applications and markets open. Will Repatriation Lead to More Dividends and Buybacks? We expect to hear a clearer picture when Apple reports its fiscal-second-quarter results around May 1 on how the company plans to leverage the benefits that President Trump's tax reform offers to AAPL's capital structure. Additionally, we'll look for Apple to discuss how liberalized U.S. repatriation taxes will impact potential dividends and share buybacks. Apple's combination of continued growth, ample cash generation and $285.1 billion in cash and marketable securities as of Dec. 30 are likely to lead to higher dividends and a robust buyback program. 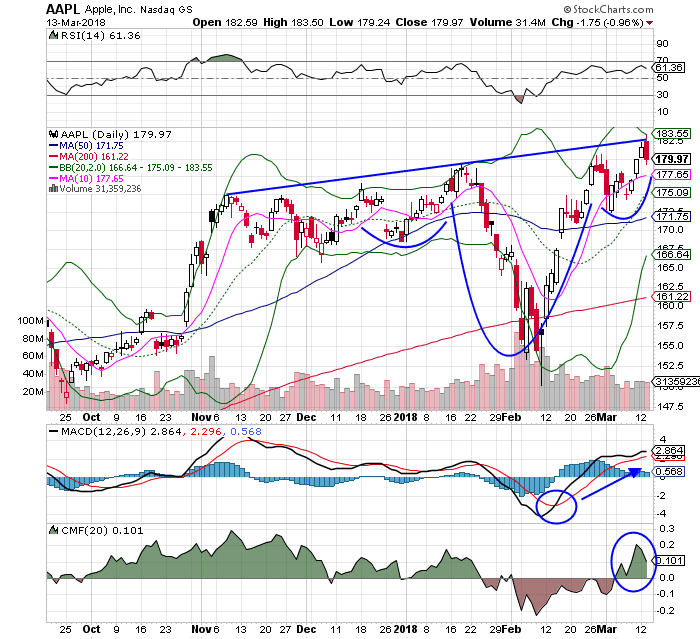 It seems like a inverse head-and-shoulders pattern has formed, which projects Apple rising to about $198 as long as the stock's next pullback remains modest. Apple's recovery from its early February deep lows came on decent volume, which is unsurprising given the fact that the stock is a big favorite of institutional holders. We also see the stock's secondary technical indicators starting to regain positive status as well. For example, Apple's Moving Average Convergence Divergence oscillator crossed over for a bullish signal around a month ago (the blue circle in the panel marked "MACD" above). The stock's Chaikin Money Flow has turned positive as well (the blue circle in the chart marked "CMF"). Add it all up and technical analysis says that after a tough start to February, this is a good time to buy or own the stock. Apple's "story" seems very much intact to us, with good technicals and several fundamental positives to be had in the coming quarters. So, we continue to see AAPL as a name to own rather than trade, as well as a name to buy on any pullbacks. As noted above, our price target remains $200, which is about 11% above the $179.97 that the stock closed at on Tuesday. This white paper is part of a series of special in-depth reports on the FAANG stocks -- Facebook (FB) , Amazon (AMZN) , Apple, Netflix (NFLX) and Google/Alphabet (GOOG) , (GOOGL) . To check out all of the reports in this series, click here. At the time of publication, Versace had no positions in the stocks mentioned, while Lang was long FB calls and short bull put spreads on FB and NFLX. However, positions may change at any time.